After my wire arrived and I finished working for the day, I got started “bending wire”. 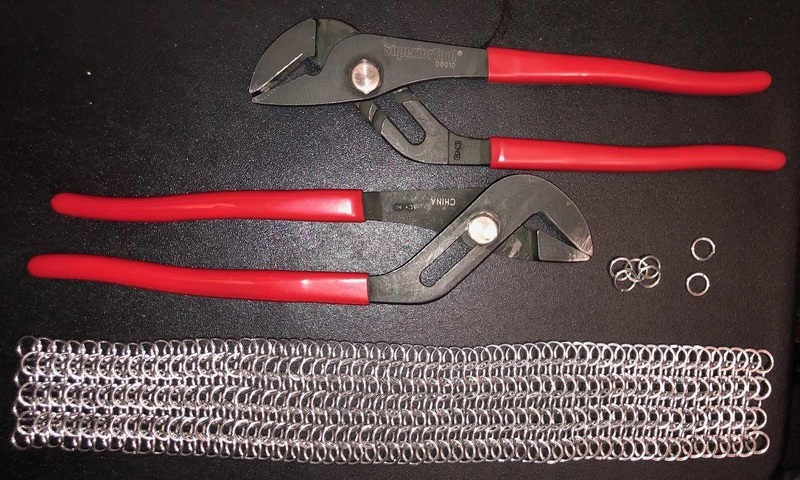 I made about four coils, cut them into rings and started weaving chain. This is the result of last night’s efforts. The pliers are there to give scale to the picture. If you look at the ends you’ll notice that I ground them down so that they provide a better surface to grip the rings. I use this pair to open and close all the rings I make when I’m making the chain. I probably won’t make as much progress tonight. I’ve got some other things to do first, for our church’s Operation Christmas Child collection week. I’ll probably just cut a few thousand rings and put them in containers.